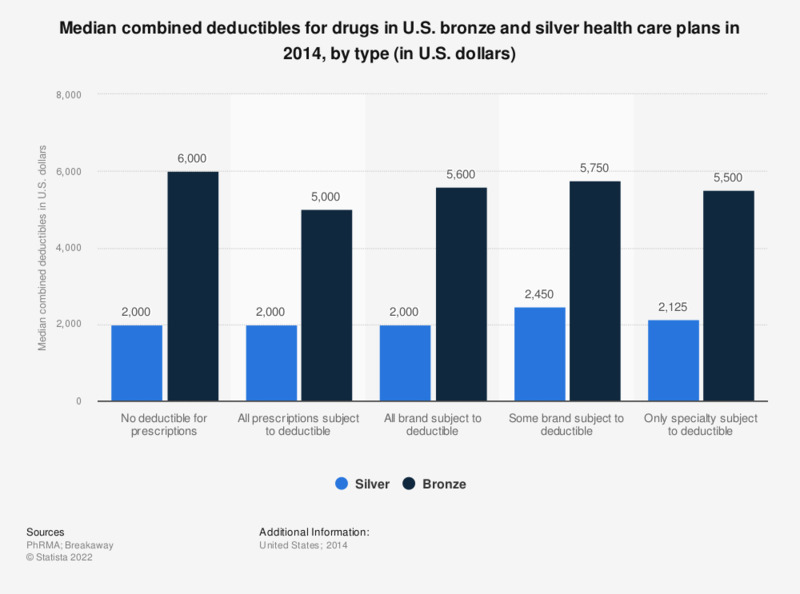 This statistic displays the median combined drug deductibles for bronze and silver health care plans in the United States as of 2014. The median combined deductible for a silver plan where all prescriptions are subject to deductible was 2,000 U.S. dollars. A deductible is set as the amount one must pay for covered medical services before the insurance begins paying. The plans differ based on the actuarial value which is the average percentage of health care expenses that are paid for the by plan, rather than out-of-pocket. In a bronze plan, 60 percent of covered medical expenses are taken care of and 70 percent in a silver plan.